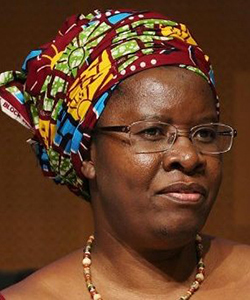 Nyaradzayi Gumbonzvanda, human rights lawyer and Zimbabwean citizen, has worked for over two decades on women’s and children’s human rights, especially in crisis countries. She is the current General Secretary of World YWCA, a global movement of 25 million women and girls in 125 countries, championing inter-generational women’s leadership and rights. She focuses on violence against women, peace with justice, sexual and reproductive health and rights, and HIV and AIDS. She served for ten years with the United Nations, through UNICEF and UNIFEM (now part of UN WOMEN) in Africa. She founded Rozaria Memorial Trust in honor of her late mother and in recognition of all unsung heroines in communities. Recently, Ms Gumbonzvanda served as Commission for the UN Commission on Information and Accountability on Women and Children’s Health. She is the 2011 recipient of the Human Rights Defenders Award, conferred by the Zimbabwe Women Lawyers Association, an organization she served as first coordinator during its formative stages. She served on the Executive Committee of Religions for Peace where she was the first women’s coordinator. She has a Master’s degree in Private Law from the University of South Africa and completed post-graduate work on conflict resolution at Uppsala University, Sweden.